The race for Attorney General is one of the more important jobs on the ballot in November, but it has generally been overlooked thanks to the Governor’s race and the meltdown in the White House. We’re here to rectify that…at least a little bit. *NOTE: When we do our “live” Debate Diaries, we normally list the most current update at the top of the page. But because we’re posting this entire Debate Diary at once, it makes more sense to write it out chronologically from the top-down. As always, unless it is in direct quotes, consider all statements paraphrased in the interest of time and/or the prevention of carpal tunnel syndrome. Wearing a dark suit and a red tie, Brauchler kicks things off with a long, meandering introduction about how his family ended up in Colorado. He stands next to the podium – rather than behind it — as he addresses the crowd, probably because some consultant told him that this is how you really connect with people. Did we mention that there is a GIGANTIC banner for the Chevron company as the background on stage? This is how Brauchler describes ‘Merica when his parents moved to Colorado. “[It was] a land at the time that was of opportunity, community, liberty, and despite its great diversity, unity.” If you’re reminded of this scene from “Happy Gilmore,” you’re not alone. Interestingly, it would appear that Brauchler has – finally — learned his lesson about the importance of Colorado water policy. It was exactly one year ago at the Club 20 event that Brauchler, then a candidate for Governor, expressed bewilderment that “water is a huge issue” in Colorado. Brauchler says that his judicial district (he is the Arapahoe County-ish District Attorney) is “the most diverse district between the Mississippi and the Pacific Ocean.” This can’t possibly be true. Brauchler then names pretty much every job he’s ever held before wrapping up his 3-minute introduction. We never did find out about those other two “30,000-foot big jobs” that he mentioned earlier. Brauchler seems nervous or over-caffeinated; there was no structure to his opening remarks. Notably, Weiser mentions water policy repeatedly, bringing up water issues in Crowley County and with the Colorado River in general. Weiser does a good job of mentioning, by name, several communities in Southern and Western Colorado and highlighting their specific concerns. 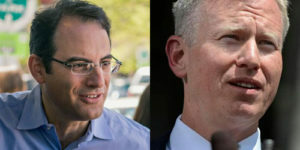 Weiser says he has a wide range of experience, “like Ken Salazar, like Cynthia Coffman, like Gale Norton.” This is obviously a line meant to push back against Brauchler’s only real attack, which is that Weiser does not have his experience as a prosecutor. Weiser closes by talking about how his family came to America after surviving the Holocaust (Weiser’s mother was literally born inside a concentration camp). After a brief explanation of the rules of this debate, we come to our first question: How do you balance water rights between the Western Slope and the Front Range. This is very vague. “When it comes to Western Slope water, the key is twofold. One, we can’t tell Southern California that they don’t need to act like they don’t need to go through any changes to keep drawing from [Lake] Mead and from [Lake] Powell.” Just like with his opening statement, Brauchler never actually gets to his second reason here. It would be hard not to get the impression that Brauchler has little understanding of water law and policy. Conservation and water storage are not “policies,” as Brauchler says, and his vague red meat statements about the Western Slope giving up too much water to the Front Range and to California don’t make any sense. At one point in his answer Brauchler readily admits that there isn’t much that can be changed regarding Colorado’s water compacts; his half-assed attempts to sound like a great defender of Western Slope water just sound like mindless pandering. “There’s no issue more important to the future of Colorado than water,” says Weiser as he begins his response. Weiser mentions that guidelines for the Colorado Water Compacts need to be addressed beginning in January, which makes it sound like he has an actual grasp of the details on this issue. Weiser wraps up his answer with a bunch of pointless platitudes about working together, but he did what he needed to do here. Brauchler is allowed a brief “rebuttal,” as per the rules of this debate, and he uses it to talk about how the Attorney General doesn’t make policy. “I will defend our water compacts and I will make sure that environmental elitists don’t deprive us of the storage that we need to build in the future on the Front Range.” This is a weird thing for Brauchler to say literally 2 minutes after he said that the Western Slope gives too much water to the Front Range. Again, Brauchler is all over the map thus far. Weiser goes first on our second question, which is about the three biggest issues facing the Attorney General’s office. Weiser names equal rights, “fair play,” and protecting Colorado’s air, land and water on its public lands. This is not a great answer. Brauchler: “You can’t get past that the first topic we covered is number one – water. That has to be a focal point on the Front Range, and until now it hasn’t been.” If Braucher is trying to convey that he has no real understanding of water issues, he’s definitely winning. Brauchler also mentions “federal overreach” and public safety. “You and I both know that crime is on the rise.” It is? Weiser can’t help but suppress a smile as Brauchler is talking. Brauchler sounds like he’s reading from a Republican polling book. From 2014. Weiser talks about the AG being a check on a federal government that violates the rule of law, using violations of the pre-existing condition piece of the Affordable Care Act as his example. The next question is about whether the candidates would defend the constitutionality of a law approved by Colorado voters even if they (or their political party) did not agree with the law. “I will defend the will of the voters of the State of Colorado,” says Brauchler. This is a decent answer, but then he goes off on another tangent about black market marijuana in rural Colorado “and in upper-middle class homes.” Huh? Weiser says he agrees with Brauchler that the AG cannot be a partisan warrior. Brauchler gets a “rebuttal” and basically just repeats what he said earlier about defending the Constitution. Next question is about how each candidate would ensure that they include perspectives from rural Colorado in any decision. Weiser says he wants to utilize telecommuting to hire attorneys in local offices, using an example of a Glenwood Springs attorney working on water policy. The remainder of his answer is boilerplate rhetoric about working together and building coalitions, yada, yada. Brauchler says basically the same thing, opening with a joke that fails to hit home. “We still subscribe to this 1860s model of state government where every agency seems to have to be a horse and buggy ride away from the Capitol just in case the Governor calls for tea.” In fairness to Brauchler, this wasn’t a terrible line; it got absolutely no reaction from the crowd, however. “What I propose to do is bolder than telecommuting,” says Brauchler before explaining his plan to put regional offices for the AG’s office around the state. So bold. Brauchler then mentions “black market marijuana” for the third time. Clearly someone told him that this was a winner. “You need an Attorney General’s office that you can walk to or drive to,” says Brauchler. Um, okay. “Branch offices are a great 20th Century solution,” retorts Weiser. This is as close as you’re going to get to a “burn” in this debate. Weiser makes a good point about telecommuting and how it can be more effective because of the impracticality of maintaining dozens and dozens of branch offices around the state. The next question begins with a statement about how Club 20 supports an “all of the above” strategy on energy development. The question is basically about how each candidate would allow oil and gas companies to do whatever they want. Did we mention that there is a GIGANTIC banner for the Chevron company as the background on stage? We did? Carry on then. “I want to have a renewable world. Believe me, I like the idea of wind and solar [power]. But when the wind doesn’t blow and the sun doesn’t shine, I like to be able to turn on the lights in my house and walk around at night.” If the sun stops shining, we’re going to have bigger problems than walking through your house without bumping your knee on the coffee table. Weiser responds by saying that Colorado is a leading example for how to protect energy interests and the environment at the same time. As an example, he uses Colorado’s ideas for dealing with methane leaks. Weiser talks about how Attorney General Cynthia Coffman refused to defend Colorado against weakening regulations from the Environmental Protection Agency under former director Scott Pruitt. “What we need is an Attorney General who will defend the sovereignty of the State of Colorado,” says Brauchler in rebuttal. This is getting tedious – on both sides. Next question is about whether each candidate would defend Colorado hemp farmers from federal overreach. Chances are about 99% that we hear the exact same answers from the last question. “I love that you talk about the 10thAmendment,” says Brauchler, pointing to Weiser. “I’m a big fan.” Ugh. Brauchler agrees with Weiser in giving a thumbs up to the hemp industry, then he mentions “black market marijuana” for the fourth time. Weiser gets time for a “rebuttal,” which is stupid. Both candidates agree on this issue. Can’t we just move along? Apparently we have concluded the “Q&A” section of the debate and are now entering the “cross-examination” phase. In other words, the candidates get to ask each other questions. Weiser asks Brauchler if he will join him in supporting Initiative 126, a ballot measure to limit the interest rate that “payday lenders” can charge customers. “I’m not sure that’s an AG question,” replies Brauchler. “That feels like a policy question.” Brauchler won’t actually answer this question – he just says that he needs to “look at it more” because he worries about putting arbitrary caps on things. Next question from Weiser is about Brauchler’s previous statements that the AG’s office doesn’t have a role in regards to rural broadband Internet. Brauchler says that this issue should be handled by the Governor and the legislature. Nobody has ever won a debate by refusing to answer policy questions on the grounds that they aren’t specifically relevant to the office being sought. Weiser asks Brauchler if the AG’s office has a role in handling public-private partnership contracts, easements, and emergency communications issues. Brauchler’s eyes go big – he looks like he knows he just walked into a trap – and he reluctantly agrees that Weiser is correct. Weiser asks Brauchler if he has any experience as an attorney dealing with broadband Internet issues. Brauchler admits that he does not. Weiser drops the hammer, asking Brauchler about prior comments that he believes Roe V. Wade should be overturned. “If this issue is before the Supreme Court, what position would you take for Colorado,” asks Weiser. Weiser reads from an Elbert County Republican Party questionnaire in which Braucher says that the results of Roe v. Wade are wrong. You can almost hear Brauchler swallowing hard. “If that’s in there, that is correct, but that’s not the same thing as seeking to have it overturned,” replies Brauchler. We discussed this response in a separate post. It’s bad. Really, really bad. “Boo all you want,” says Brauchler, looking like someone just hit him in the face with a 2×4. Brauchler is visibly shaken by screwing up this response so terribly; as Weiser continues talking, Brauchler begins massaging his face in frustration. “Is that a view you hold?” asks Weiser. “No. What you’re quoting is something that, interestingly, just came up again after 11 years and multiple times of being asked about it on the campaign trail for DA.” Brauchler explains that it was part of a “back-and-forth” on a radio show, then adds this incredibly tone-deaf qualifier: “And it was about the Navy specifically. It wasn’t about all of the military.” Oh, well, that makes it better. “I love ‘The Wire,’ but there’s not enough episodes to compete with ‘Seinfeld,’” says Brauchler, who nevertheless looks distressed at what happened 30 seconds earlier. There’s no mistaking the disappointment on his face. Weiser replies that the last time he checked, CU was leading Nebraska. Brauchler mocks concern and repeats his question. “Sounds like, ‘no,’” says Brauchler. Weiser, meanwhile, is talking to someone in the audience who informs him that CU pulled out the victory. He flashes a thumbs up sign. Brauchler then whoops and holds his arm out for a fist-bump from Weiser. Maybe he’s just hoping that nobody noticed what happened a few minutes ago. Brauchler asks Weiser to name a policy proposed by Jared Polis that he disagrees with. Weiser says he can name two, but Brauchler says he can only name one. Weiser mentions Polis’ proposal about blockchain technology. Brauchler tries to cut him off, but Weiser continues by saying that he wants to create a Chief Innovation Officer and Chief Diversity Officer. “Those are the two big differences you have with Jared Polis?” replies Brauchler. “Got it.” For some reason, Brauchler seems to think that he landed a serious blow with this query. Brauchler then tries to get Weiser to say that he agrees with the Clean Power Plan. Weiser replies that Colorado was compliant with the Obama-era rule. Brauchler pushes for an answer. Weiser says he agrees. Brauchler pretends this is a big deal. Nobody cares. “The Martinez case…” starts Brauchler. After about 20 seconds of rambling, Brauchler asks Weiser if he would appeal the decision as AG. We have absolutely no idea what Brauchler is talking about. From the silence in the room, we’d guess we aren’t alone. Weiser tries to explain the case and then says that he would not appeal. Again, Brauchler seems to think this is a gotcha moment. Again, Brauchler is wrong. “The Attorney General gave bad legal advice on that issue,” says Weiser. “Two more questions,” says Brauchler. The audience applauds – maybe because Brauchler indicated that we are almost finished. “Is it fair to say that you have never set foot inside a courtroom in Colorado to do a trial?” asks Brauchler. Weiser says he has argued several appeals in Colorado. Brauchler interrupts and says, “in federal court?” Here’s an idea, George: You should probably know the answer to these “gotcha” questions before you ask them. “But you’ve done nothing in Colorado courts?” says Brauchler. We get what Brauchler is trying to do here, but it’s not working. “Is it fair to say that you have never practiced Colorado law at any time?” asks Brauchler. “We’re done,” says Brauchler. Whaaaa??? Weiser goes first. He talks about the importance of allowing women in Colorado to have access to birth control and the option of having an abortion. The audience applauds. Weiser talks about LGBTQ rights. The audience applauds. Weiser talks about health care access. The audience applauds. Weiser says he’ll lead on water issues. The audience applauds. The audience is trying to will this debate to come to an end. Weiser wraps up by thanking Brauchler for participating in a civil discourse, then adds this line, “As Attorney General, I look forward to working with George.” The audience laughs. That was pretty good. Brauchler says he didn’t decide to run for AG based on who was in the White House. No, he decided to run for AG because he failed spectacularly as a candidate for Governor. “I have spent my entire adult life in action,” says Brauchler. Neat. He mentions something about getting the largest sentence for human trafficking in the history of the country. This would have been a good thing to bring up a LOT earlier. “As the son of a champion for civil rights, I tell you I am the anti-bullying bully,” declares Brauchler. The audience chuckles. They are not laughing with him. Brauchler supporters who thought their candidate would shine in a debate setting were in for a rude awakening last weekend. No impartial observer could say that Brauchler did anything other than land squarely on his face during these 40 minutes in Grand Junction. Brauchler was absolutely brutal, performing like a candidate who just showed up to a debate without any preparation whatsoever. The best thing we can say to Republicans about Brauchler is this: At least he’s not your candidate for Governor. Weiser, on the other hand, was more prepared and clearly more confident in front of an audience that should have benefitted Brauchler. Weiser landed two HUGE blows late in the discussion when he caught Brauchler on questions about Roe v. Wade and LGBTQ rights, and he was in charge throughout the debate. My favorite line has to be Brauchler thinking people need to be able to walk or drive to the state AG's offices. I'm not a lawyer and my only brushes with Colorado law were small claims court, providing a set of facts for an attorney out of the Denver County DAs office, and serving on a couple of juries, Wouldn't the phone or a web connection be more convenient for virtually anything a citizen needs to do with the state AG office? As a lawyer, I've dealt with the AG many times over the years. Mostly by phone and email or in person in court. I've been to a handful of meetings there, out of hundreds of interactions. Brauchler's statement was just plain stupid, which, considering the source, is par for the course.